Additional Features and Amenities Complete and total privacy is yours in this hidden gem! 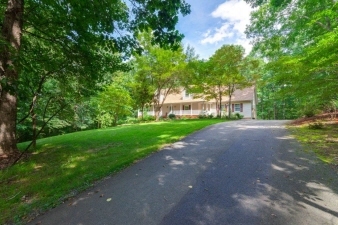 As you drive down Hulls Chapel Road you get to what you think is the end – you are at the intersection of Lakebreeze Way – you continue straight for ½ of a mile, then bear left for another ½ mile and bear right up the paved driveway and all of a sudden the trees open and you are home! Now it is time to relax and enjoy mother nature all around you. Savor a nice glass of wine on the front porch and listen to the soft water feature and just listen while you take in the private five acres of this home. If you need something a bit more fun how about the hot tub in the back yard where you can lay back and just let the cares of the world go by. All these perks before you even get inside! Inside you are greeted with a cozy formal living room with a fireplace and gorgeous hardwood floors. These shiny floors continue into the large country kitchen that has been updated to include granite and stainless appliances.